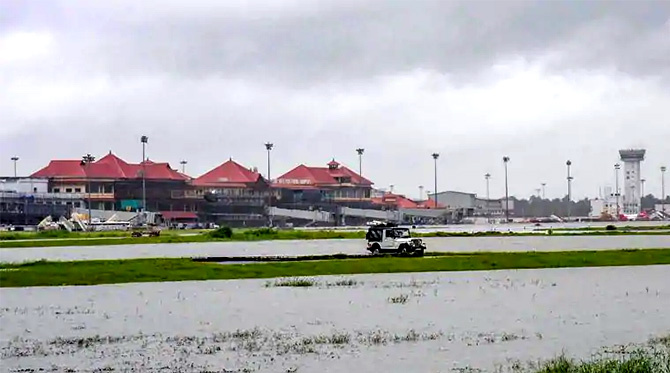 Cochin International Airport Ltd (CIAL) and the Airports Authority of India (AAI) have filed claims totalling Rs 336 crore with New India Assurance (NIA) general insurance company owing to the damage caused by the recent floods in the state, said a senior official of CIAL. Speaking to Business Standard, a senior executive of NIA confirmed the development and said that the insurance company is assessing damage to the airport’s assets. The insurer expects to pay out a little over Rs 200 crore towards the claim. However, this is a preliminary estimate as the investigations are only in an early stage. CIAL had shut operations for 14 days from August 15 as many assets of the airport were submerged under water and found to be destroyed. The assets damaged include the main runway(s), taxi bay to the terminals, 22 X-ray machines, all furniture at the domestic terminal, four conveyor belts as well as the solar panels which power the airport. A big wall also collapsed. The total damage to the assets and operations of CIAL is estimated to be Rs 300 crore. Earlier this month, CIAL said it would be creating a master plan with technical consultant Kitco, alongside the state government, to build capabilities to meet emergency situations like floods or other natural calamities. The company, will also rope in two Dutch consultants to assess the master plan, given the latter’s expertise in tackling flood-related problems. CIAL resumed full-scale operations on August 29 and began to work on repairing damaged assets at the airport. Business Standard has sent queries to NIA and will include their comments as and when received. The Kerala government has estimated that the state suffered estimated losses of about Rs 20,000 crore as a result of the floods. On August 8, the state received 310 mm rain over 24 hours, which prompted the government to open around 24 dams as the water levels rose to ‘unsafe’ levels. The government opened the Idukki dam on August 9 which has not been happened in 26 years. Following opening reservoir gates at multiple dams, several districts were submerged and over 11,000 houses have been damaged. About 252 people were killed and nearly one million were moved to relief camps. Now that the flood waters have receded, reports suggest that people are leaving the relief camps and going back to their homes. Analysts estimate that due to floods in the state, the general insurance industry will receive claims in excess of Rs 10 billion, while life insurance companies could receive claims between Rs 450 crore and Rs 800 crore. Insurance executives and the regulator are working on the contours of a catastrophic insurance policy that state governments and large companies can purchase to guard against huge financial costs of repair and rehabilitation incurred in the event of a natural disaster.